EURUSD reached the lowest level since November last year and today there are no major economic reports in Eurozone. The support rests at 1.12700 with resistance at 1.12940 which both lines are below the weekly pivot point at 1.13680. The EMA of 10 is moving with bearish bias in the descendant channel and it is below the EMA 100 and the EMA of 200. The RSI is moving in oversold area and the Stochastic is moving in low ranges. The MACD line is below the signal line in the negative territory. The ADX is not showing any clear signals. It seems that EURUSD is trying to form the correction pattern within Andrews’ Pitchfork but the indicators are showing downward pressure. 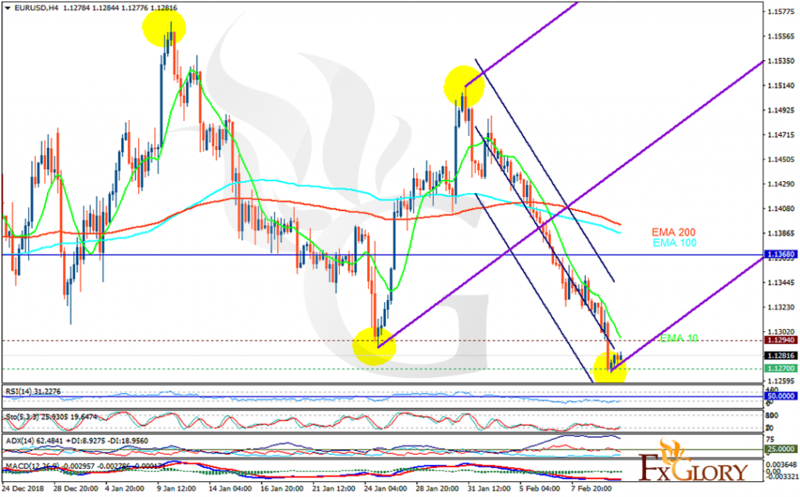 The support level breakthrough will push the price down towards 1.12290, otherwise, EURUSD grows towards 1.1355.